Do you care about sustainability? 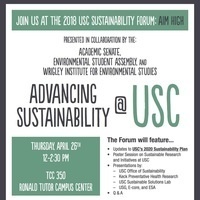 Get all the latest updates on what USC is doing in terms of sustainability and bring ideas forth for advancements. Be informed on the latest issues, and let your voice be heard! Light lunch from Greenleaf will be provided, curtesy of ESA!